Written by Alexander Bassos, JD with contributions by Keith I. Linn, PsyD. 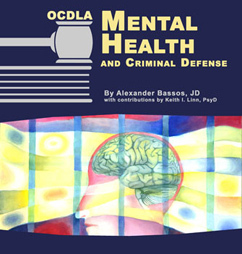 In Mental Health & Criminal Defense, Alex Bassos, JD, expertly analyzes every aspect of a criminal case involving clients with mental health or cognitive issues and challenges attorneys to "push back against the state's attempts to punish a person for having a mental illness." From reminding us that "diminished capacity" doesn't appear in the Oregon Revised Statutes to exhorting us to hold the state to its burden of proving the mental state of the charged crime, from the how-tos of civil commitment including the mental health exam, to the defense of GEI, Bassos delivers compelling arguments on every page. Included are impeccable chapters on dangerousness and crossing the mental health expert, as well as a thorough glossary and a chapter covering everything you need to know about clinical assessment and testing. A tour de force, with major contributions by Keith I. Linn, PsyD.